The last thing you need when you get home is something making noise and hovering underfoot. This modified Roomba avoids users when it detects high levels of stress. 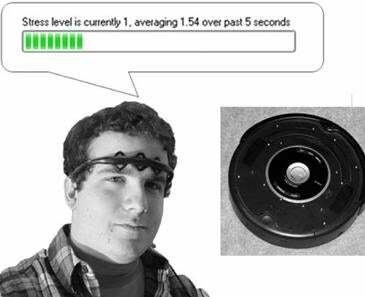 Designed by researchers at the University of Calgary, this Roomba interacts with a commercial headband for gamers that detects muscle tension in the face. The more tension it detects, the farther away the Roomba will hover from the subject.